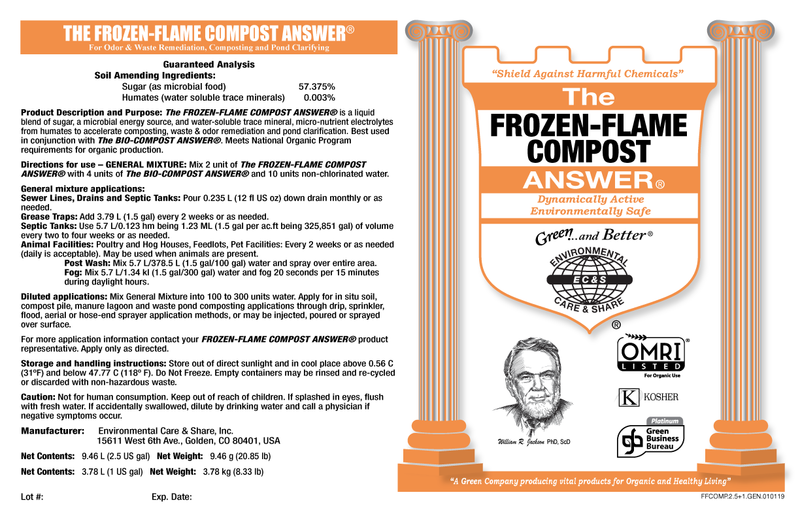 What is THE FROZEN-FLAME COMPOST ANSWER® & what is its purpose? The FROZEN-FLAME COMPOST ANSWER® is a liquid blend of organic electrolytes and micro-nutrients available to help accelerate microbiological activity in manure and plant waste composting, waste site storage, and other composting applications. 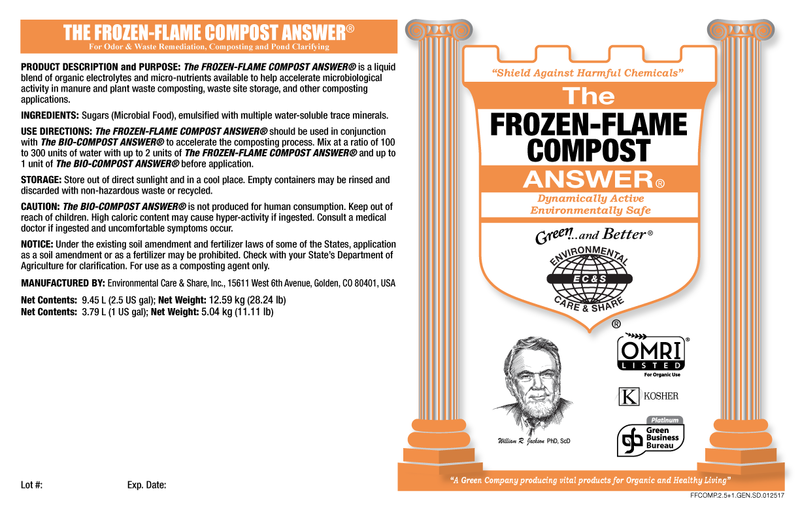 The FROZEN-FLAME COMPOST ANSWER® aids The Bio-Compost Answer, as it accelerates the microbiological activity within manure and plant waste composting, waste site storage, and other composting applications.The FROZEN-FLAME COMPOST ANSWER® is a liquid blend of water, organic electrolytes, micronutrients and polyglucosides. The homogenized polysaccharides as crystalline fructose and multiple glucose substances emulsified with multiple water-soluble trace minerals. The FROZEN-FLAME COMPOST ANSWER® should be used in conjunction with The BIO-COMPOST ANSWER® to accelerate the composting process. Mix at a ratio of 100 to 300 units of water with up to 2 units of The FROZEN-FLAME COMPOST ANSWER® and up to 1 unit of The BIO-COMPOST ANSWER® before application. Sugars (Microbial Food), emulsified with multiple water-soluble trace minerals. 2 – 2.5 gallon containers per carton. 36 cartons (180 gallons) per pallet.